A Jewish wedding is a wedding ceremony that follows Jewish laws and traditions. While wedding ceremonies vary, common features of a Jewish wedding include a ketubah (marriage contract) which is signed by two witnesses, a wedding canopy (chuppah or huppah), a ring owned by the groom that is given to the bride under the canopy and the breaking of a glass. 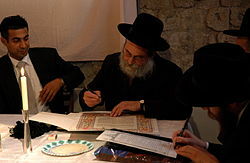 Before the wedding ceremony, the chatan (groom) agrees to be bound by the terms of the ketubah, or marriage contract, in the presence of two witnesses, whereupon the witnesses sign the ketubah. 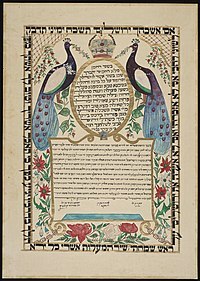 The ketubah details the obligations of the groom to the kallah (bride), among which are food, clothing, and marital relations. This document has the standing of a legally binding agreement, though it may be hard to collect these amounts in a US court house. It is often written as an illuminated manuscript that is framed and displayed in their home. Under the chuppah, it is traditional to read the signed ketubah aloud, usually in the Aramaic original, but sometimes in translation. Traditionally, this is done to separate the two basic parts of the wedding. Non-Orthodox Jewish couples may opt for a bilingual ketubah, or for a shortened version to be read out. Prior to the ceremony, Ashkenazi Jews have a custom to cover the face of the bride (usually with a veil), and a prayer is often said for her based on the words spoken to Rebecca in Genesis 24:60. 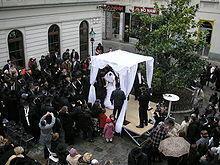 The veiling ritual is known in Yiddish as badeken. Various reasons are given for the veil and the ceremony, a commonly accepted reason is that it reminds the Jewish people of how Jacob was tricked by Laban into marrying Leah before Rachel, as her face was covered by her veil (see Vayetze). Another reasoning is that Rebecca is said to have veiled herself when approached by Isaac, who would become her husband. Sephardi Jews do not perform this ceremony. Additionally, the veil emphasizes that the groom is not solely interested in the bride's external beauty, which fades with time; but rather in her inner beauty which she will never lose. In many Orthodox Jewish communities, the bride is escorted to the chuppah by her father and mother  known by Ashkenazi Jews as unterfirers (Yiddish, lit. ones who lead under). The bride traditionally walks around the groom three or seven times when she arrives at the Chuppah. This may derive from Jeremiah 31:22, “A woman shall surround a man”. The three circuits may represent the three virtues of marriage: righteousness, justice and loving kindness (see Hosea 2:19). Seven circuits derives from the Biblical concept that seven denotes perfection or completeness. Sephardic Jews do not perform this ceremony. 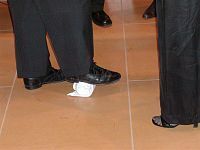 After the bride has been given the ring, or at the end of the ceremony (depending on local custom), the groom breaks a glass, crushing it with his right foot, and the guests shout "מזל טוב‎" (mazel tov! 'congratulations'). At some contemporary weddings, a lightbulb may be substituted because it is thinner and more easily broken, and it makes a louder popping sound. The origin of this custom is unknown, although many reasons have been given. The primary reason is that joy must always be tempered. This is based on two accounts in the Talmud of rabbis who, upon seeing that their son's wedding celebration was getting out of hand, broke a vessel – in the second case a glass – to calm things down. Another explanation is that it is a reminder that despite the joy, Jews still mourn the destruction of the Temple in Jerusalem. Because of this, some recite the verses "If I forget thee / O Jerusalem..." (Ps. 137:5) at this point. Many other reasons have been given by traditional authorities. Former Sephardic Chief Rabbi of Israel Ovadia Yosef has strongly criticized the way this custom is sometimes carried out, arguing that "Many unknowledgeable people fill their mouths with laughter during the breaking of the glass, shouting 'mazel tov' and turning a beautiful custom meant to express our sorrow" over Jerusalem's destruction "into an opportunity for lightheadedness." Reform Judaism has a new custom where brides and grooms break the wine glass together. In Yemen, the Jewish practice was not for the groom and his bride to be secluded in a canopy (chuppah), as is widely practiced today in Jewish weddings, but rather in a bridal chamber that was, in effect, a highly decorated room in the house of the groom. This room was traditionally decorated with large hanging sheets of colored, patterned cloth, replete with wall cushions and short-length mattresses for reclining. Their marriage is consummated when they have been left together alone in this room. This ancient practice finds expression in the writings of Isaac ben Abba Mari (c. 1122 – c. 1193), author of Sefer ha-'Ittur, concerning the Benediction of the Bridegroom: "Now the chuppah is when her father delivers her onto her husband, bringing her into that house wherein is some new innovation, such as the sheets… surrounding the walls, etc. For we recite in the Jerusalem Talmud, Sotah 46a (Sotah 9:15), 'Those bridal chambers, (chuppoth hathanim), they hang within them patterned sheets and gold-embroidered ribbons, and more. The "Horah" is a Middle Eastern/Israeli style dance usually played as a second dance set. After the meal, Birkat Hamazon (Grace after meals) is recited, followed by sheva brachot. At a wedding banquet, the wording of the blessings preceding Birkat Hamazon is slightly different from the everyday version. Prayer booklets called benchers, may be handed out to guests. After the prayers, the blessing over the wine is recited, with two glasses of wine poured together into a third, symbolising the creation of a new life together. 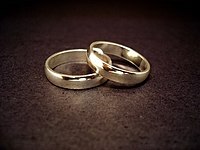 In recent years, the governing bodies of several branches of Judaism have developed standard Jewish prenuptial agreements designed to prevent a man from withholding a get (Jewish bill of divorce) from his wife, should she want one. Such documents have been developed and widely used in the United States, Israel, the United Kingdom and other places. This article incorporates text from a publication now in the public domain: Singer, Isidore; et al., eds. (1901–1906). "marriage ceremonies". The Jewish Encyclopedia. New York: Funk & Wagnalls. ^ "Is the Ketubah contract legit or just a ceremony?". Ketubah 4 You. ^ "The Jewish Wedding Ceremony by Rabbi Mordechai Becher". ^ "Chuppah". Jewish-wedding-planner.com. Retrieved 2012-11-09. ^ "View Chuppah listings and search for Simchas listings". Jewpro.co.uk. Retrieved 2012-11-09. ^ "Badeken -- Veiling". Chabad.org. Chabad-Lubavitch Media Center. Retrieved 20 January 2019. ^ "Badeken -- Veiling, guide to a Jewish wedding". ^ a b "OzTorah » Blog Archive » A guide to the Jewish marriage ceremony". ^ "Jewish Wedding Ring". Judaism.about.com. 2009-12-17. Retrieved 2012-11-09. ^ Dovii, Mane (17 January 2010). "מון". מון אירועים, (מון סטון). www.moon-events.co.il. Retrieved 14 June 2016. ^ Marlena Thompson. "Jewish Life Cycle/Rituals: Marriage". Jewishfederations.org. Retrieved 2015-10-11. ^ "Shalom! Rabbi Dina-Hasida Mercy on Marriage". Rabbi-mercy.com. 2009-02-18. Archived from the original on 2012-03-10. Retrieved 2012-11-09. ^ "June 2010, Rethinking Jewish Weddings". Shmadigital.com. 2010-06-03. Archived from the original on 2012-03-10. Retrieved 2012-11-09. ^ Chaplain (CPT) Shlomo Shulman (2001-06-30). "Guide to the Jewish Wedding: Jewish wedding program, jewish wedding traditions, Chuppah, Ketubah". Aish.com. Retrieved 2012-11-09. ^ "Jewish wedding guide". SomethingJewish.co.uk. 2012-09-30. Retrieved 2014-07-08. ^ "The Jewish Wedding". Beingjewish.com. Retrieved 2012-11-09. ^ "Get smashed… & mazel tov". Cleveland Jewish News. 2011-10-05. Retrieved 2014-07-08. ^ "Senior Israeli Rabbi Slams 'Breaking of the Glass" at Weddings". Israel National News. 2010-02-13. Retrieved 2012-11-09. ^ "Yichud—a romantic oasis - Weddings". ^ "Marriage". Jewishvirtuallibrary.org. 1996-11-08. Retrieved 2012-11-09. ^ a b "Jewish Wedding Reception Rituals". ^ "Jewish Wedding Music Videos". ^ "Birkat HaMazon - Encyclopedia Judaica".